Plitvice Lakes is a World Heritage Site and National Park in Croatia. Waters flowing over the limestone and chalk have deposited minerals, and created natural dams. 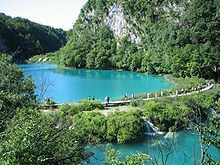 The result is a series of beautiful lakes, caves and waterfalls. The forests in the park are home to bears, wolves and many rare birds. Plitvice is the oldest national park in southeast Europe and the largest national park in Croatia. 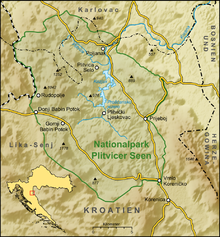 It was founded in 1949 and is in the mountainous karst area of central Croatia, at the border with Bosnia and Herzegovina. In 1979, Plitvice Lakes was one of the first natural sites added to the UNESCO World Heritage register. Each year, more than 900,000 visitors are recorded. The area includes forests, meadows and water plants; ecologically it ranges from Alpine to Mediterranean conditions. Of over 1,000 types of plant, 75 are endemic, found naturally only here, and 55 are species of orchids. The park is home to a wide variety of animal and bird species. Rare fauna such as the European brown bear, wolf, eagle, owl, lynx, wild cat, capercaillie and many bats are there, with many more common species. 157 species of birds have been recorded, 70 of which nest in the area. 12 amphibian species and lizards, snakes and turtles are there also. ↑ Croatia was once part of Yugoslavia. This page was last changed on 22 February 2014, at 19:30.